Kenneth Cole Reaction Dual Compartment Top Zip Computer Portfolio Case. Product Features Checkpoint friendly / EZ-Scan feature compliant with TSA guidelines Compatible with most tablets 1680D polyester/dobby exterior with faux leather trim and a fully lined interior Front exterior zipper pocket features an extensive organizer Front exterior stash pocket for easy access items Front compartment features a file divider and padded tablet pocket Rear compartment is padded to fit most laptops EZ scan section includes three zipper pockets for cords and accessories Rear exterior trolley strap for hands free carrying. 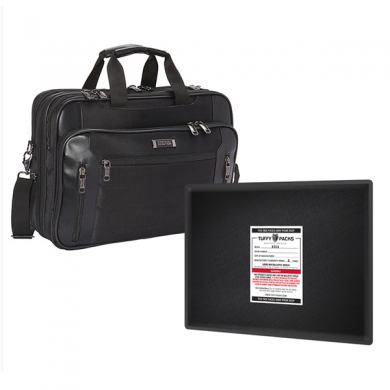 This specially designed Insert is designed to fit into the Kenneth Cole Case measuring 11"x14". This insert provides ballistic protection from handgun fire and can stop multiple rounds. Manufactured with 24 layers of Twaron, a high performance to weight ratio material like Kevlar, this insert is extremely light while meeting Level IIIA standards.